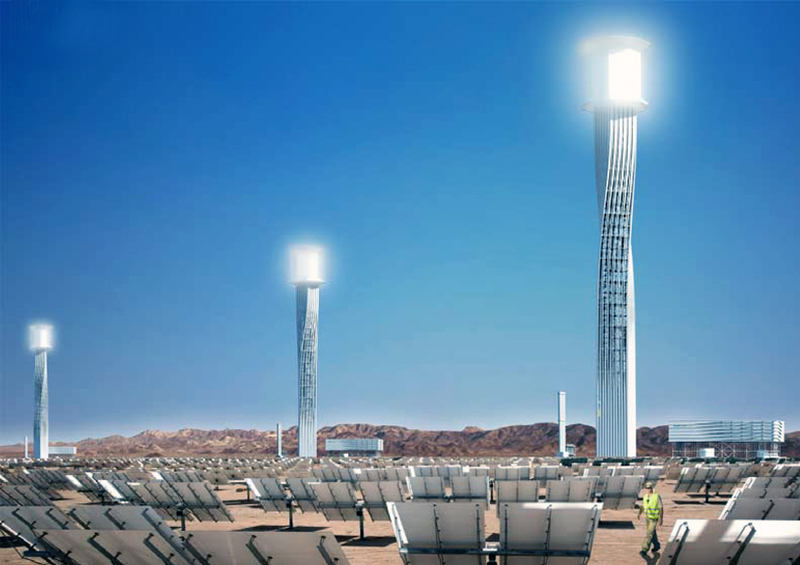 two models of tower have been proposed by zurich architecture studio rafaa for use in the ‘ivanpah solar electric generating system’ (‘ISEGS‘), whose construction is underway in california’s mojave desert. spanning 3600 acres, ‘ivanpah’ is a 3-plant solar electric generating complex that utilizes brightsource energy‘s ‘luz power tower’ (LPT) 550 technology to source an expected gross 392-megawatts of solar thermal power. LPT makes use of a field of 173,500 heliostats, effectively rotating mirrors, to concentrate the sun’s rays onto a solar receiver atop a 450-foot power tower. generating steam, this receiver operates a traditional turbine and generator, creating electricity. the structures proposed by rafaa would act as the power towers of the system. the studio has offered two models for the construction: a twisted linear-based ‘option a’ and the cylindrical honeycombed ‘option b’, both designed in collaboration with schlaich, bergermann, und partner engineering consultants. capable during peak hours of providing enough electricity to serve 140,000 homes, the project will provide power to two californian electrical companies over its predicted 30-year lifespan. dry-cooling technology reduces the facility’s water usage by over 90% compared to conventional systems, while water produced it recirculated and used to clean the heliostats’ mirrors. concerns about protecting tortoises and vegetation native to the site are being worked through by the company, which employs biologists and surveyors on-site to locate and either shelter (with man-made tortoise burrows) or move any wildlife. construction of the facility involves the insertion of pylons directly into the ground, preserving natural vegetation.